nice to meet you! we’re oyin handmade! It’s the Yoruba word for ‘honey’ – one of nature’s most versatile beauty products! Many of our products utilize the power and sweetness of honey, and all are made from scratch, by hand, in small batches to ensure freshness. are your products really awesome? We never use petroleum, silicones, parabens, or non-nourishing fillers – every ingredient in our mixtures has work to do! The result is luxurious natural products that are excellent for a wide range of hair types. Our goodies are designed with a focus not only on aesthetics and styling, but the nourishment and health of hair & skin... And we think that’s pretty awesome! We believe everyone’s hair and skin can benefit from handcrafted goodies made with love! 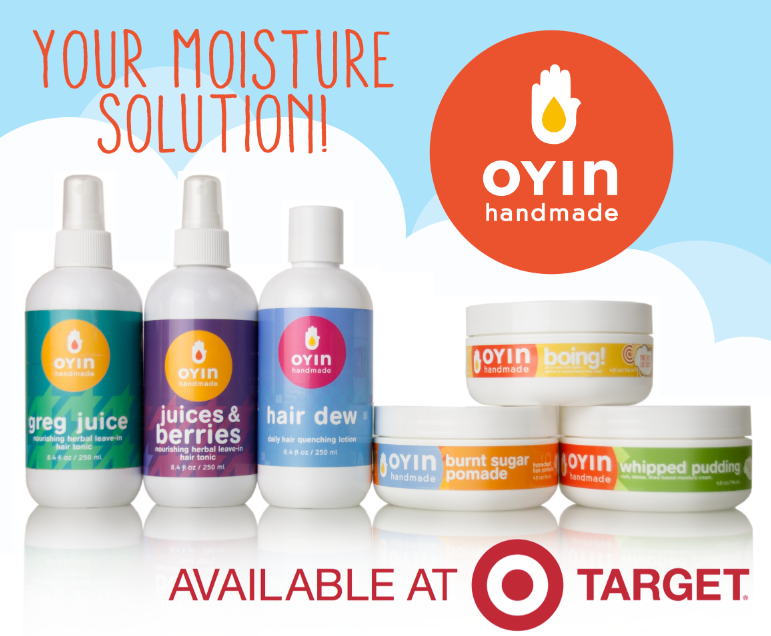 How to use Oyin for maximum awesomeness! Separating hair into sections can greatly reduce tangles and knots while washing. Honey Wash, Grand Poo Bar, and Simple Soap are gentle cleansers that remove dirt & buildup without stripping hair dry. *pro tip: alternate your wash sessions with Honey Hemp Conditioner 'washes' for a hydrating rinse! Highly textured hair is prone to breakage when dry. Gently detangle your coily strands while soaked in Honey Hemp. Work your way from ends to roots with a wide tooth comb or paddle brush. Loosely braid or twist each detangled section when complete. Perhaps the most important step in natural hair care! Whipped Pudding, Hair Dew and the Juices all add moisture and nourish thirsty strands. Work a generous amount through damp or dry hair for lush, juicy curls and kinks. Continue to gently manage your hair while styling to prevent breakage. Avoid rubber hair accessories that can snag strands. Use Shine & Define to tame frizzies while adding soft definition to twists and braids. Burnt Sugar is perfect for protecting ends or kicking up the shine factor.